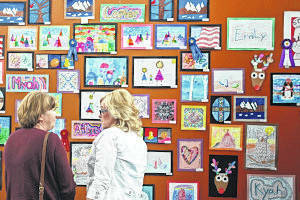 Guests enjoy the artwork on display at last year’s Southern State Art Show. The 2018 Southern State Art Show will be held 4:30-6:30 p.m. Wednesday, April 18 in the Community Center on the college’s Fayette Campus, 1270 U.S. 62 SW, Washington C.H. This annual event showcases the talents of SSCC students, as well as local elementary, middle, and high school students. Light refreshments will be served. During the Southern State Art Show, attendees can also take part in Business After Hours, an event organized by the Fayette County Chamber of Commerce. For more information, please visit www.sscc.edu/students/events/artshow.shtml. https://www.recordherald.com/wp-content/uploads/sites/27/2018/04/web1_artshow.jpgGuests enjoy the artwork on display at last year’s Southern State Art Show.